Happy Friday! Not only is today Friday, it is also my husband Zach's birthday! And not only is today Zach's birthday, we're in San Francisco to celebrate! We've had a lot going on this summer, so I thought it would be fun to surprise Zach with a weekend away to explore, eat & drink our weight in good food and spend time with friends! 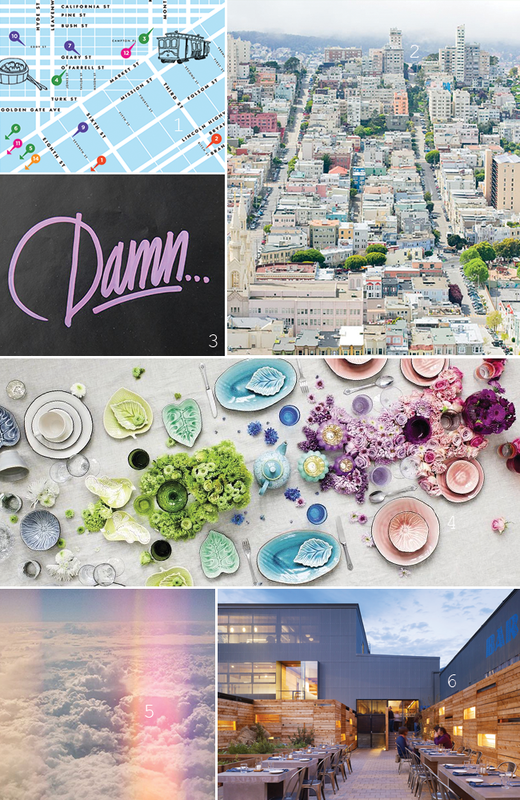 To prepare, I've been reading up on all of the best new places to visit, so naturally this week's favorites are inspired by the great city of San Francisco. The always helpful, Kate Spade City Guides. It was fun to see San Francisco though Parisian's eyes. A beautifully executed and oh-so inspiring tablescape. We have a short flight ahead of us, but I can't wait to turn up the tunes and zone out to this view. We're trying to keep our plans pretty open, but making a reservation at Bar Agricole was a must. I can't wait! Have fun!! Give me some suggestions on where to go- I'll be up there later this month. Will do! Will be posting about our trip and will give you all the great spots!